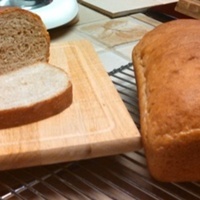 This recipe makes 3 large loaves of sweet soft whole wheat bread, good for sandwiches, french toast or with butter and jelly. Adapted from Cunningham, Marion. The Fannie Farmer Cookbook, 1996, p 516. ©2007-2014 Netta Belle’s Choice® cookbookinabox® “Reg. U.S. Pat. & Trdmk.Off.” Reg. “Trade-marks Canadian Intellectual Property Office.” nettabelleschoice.com and cookbookinabox.com. Mix water and milk in sauce pan to heat to 115 F.
Measure the flours: sift together 4 cups of whole wheat and 4 cups of unbleached all-purpose flour. Reserve 4 cups of white flour. Heat 1 cup warm water to 102-105 F, add the yeast to dissolve. Stir, it will become foamy and small bubbles on surface of water. Let set about 5-8 minutes to allow yeast proof, become active. Pour yeast into the seasoned milk/water mixture. Resume kneading for 10 minutes, adding more flour to keep from sticking on board. Knead until smooth and elastic. Oil a large bowl, roll the dough into a ball, making sure it is covered with thin layer of oil. Cover bowl, place in warm, 75-85 F, area to rise until double in bulk, about 1 hour. Do not disturb during rise time. Grease 3 9 x 5 1/2 x 3 inch bread pans. When finger is pressed into dough leaving an indention, it is ready to be punch down with fists, allowing the gases escape. Pour on lightly floured board, but into 3 equal parts. Roll each into a ball, let rest. Roll each ball into a rectangle about 9 x 12 ", starting the 9" end, roll up, pinching the ends and seam together, putting seam on the bottom. Put into the loaf pans, ends touching pan. Cover the pans and set in warm place to rise again, about 45 minutes. At the end of second rise, put into oven to bake about 45 minutes. Put foil over top of bread if it browns too quickly. I remove the bread from the pans about 35 - 40 minutes and set the bread in the oven for about 5 minutes. To have soft crusts, cover with towel until bread has completely cooled. Cutting loaves with electric knife yields 16 slices from each loaf. Wrap in aluminum foil and in freezer paper or plastic bag to freeze. When ready to use, put into a 350 F for 30 minutes to thaw. Do not put into the refrigerator. I like this. i will keep your recipe.